Well we’ve covered video coverage and print coverage of the Pro-Test rally, now onto the blogs. Before we get too deep into the UCLA Pro-Test coverage, many of the blogs, including the highly-read Pharyngula blog, have talked about the poll attached to the LA Times article. The poll has (somewhat suspiciously for both sides) attracted over 150,000 votes, with the Pro-Testers currently leading this simplistic dichotomy (see Adventure in Ethics and Science blog on this) by around 60%. So in the words of PZ Myers “please, go forth and destroy this pointless metric”. For too long, animal rights extremists have had the public relations stage virtually to themselves, and this Pro-Test Rally was an excellent demonstration of what scientists can do when they refuse to be cowed. Remember, this is about animal welfare, but not animal rights. Animal welfare. Scientists are very much concerned with animal welfare, and animal research is a highly regulated endeavor. Nick Anthis’s Scientific Activist blog also wrote a fantastic and comprehensive report of the rally coverage. 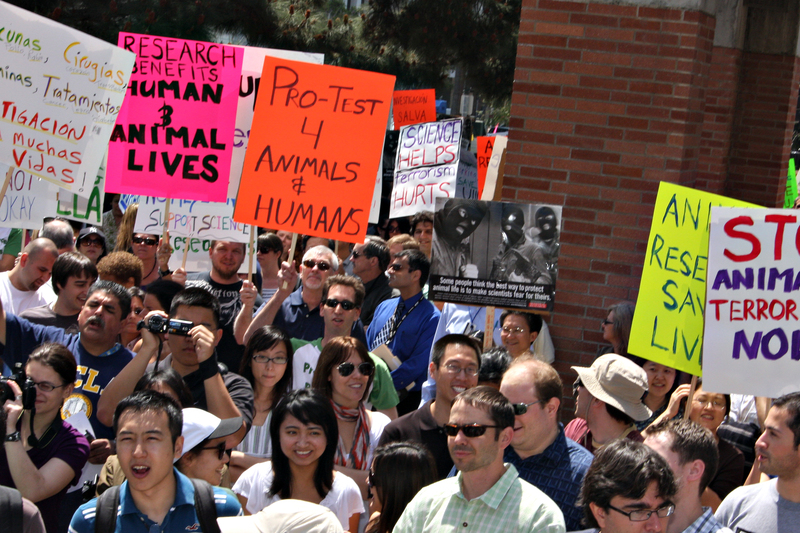 By all accounts, yesterday’s UCLA Pro-Test rally in support of animal research was a great success. Up to 800 people showed up for the Pro-Test rally, but only 30-40 people showed up for a concurrent anti-research rally. The organizers of today’s Pro-Test rally at the University of California, Los Angeles, say it succeeded beyond their hopes. Hundreds of people—many of them students and postdocs—came out to show their support for biomedical research. The Pharyngula blog announced “I am Pro-Test”. Drug Monkey mentioned some video coverage among his two posts on the issue, and Neurotopia v. 2.0 showed their excitment about the rally. So that’s the coverage all wrapped up, if you know of any more leave a comment. Posted on April 28, 2009 October 6, 2013 by EditorPosted in Campus Activism, News, SR in the Media, SR NewsTagged adventure in ethics and science, blog coverage, demonstration, drug monkey, greg miller, LA Times, march, Nick Anthis, Pharyngula, poll, pro-test, pro-test ucla, PZ Myers, respectful insolence, science journal, scientific activist, ucla, ucla pro-test. While we’re on the subject of blogs, Ed Yong has an excellent post on his bolg “Not Exactly Rocket Science” about a study where scientists at the University of Central Florida has managed to reawaken a guardian gene that has been lying dormant in our genomes for 7 million years but which is active in some monkey species where it protects them from HIV-like viruses. What is interesting is that although they used antibiotics called aminoglycosides to restore production of this gene they mention a new drug named PTC-124 that works in the same way as the aminoglycosides. PTC-124 has the advantage of being far less toxic than the aminoglycosides when used over long periods of time, and is currently performing well in clinical trials for the genetic diseases Duchenne Muscular Dystrophy and Cystic Fibrosis. If these trials continue to go well and in vitro and animal studies of PTC-124 against HIV are promising than PTC-124 may soon be in trails against HIV. This is another example of why studying the differences between species can lead to valuable discoveries, and of course animal research was very important to the development and evaluation of PTC-124 prior to the start of human clinical trials.